That's right—our brains have their own predetermined 24-hour cycle. On a day-to-day basis, you can alter your sunlight exposure or sleeping patterns, but—as you've probably experienced—at a cost. In reality, your confused brain prefers to keep its own schedule, thank you very much. Some research suggests that setting our clocks an hour back this Sunday can take between two and three weeks to fully adjust. Luckily, our circadian rhythms aren't completely set in stone. Interestingly, research shows that mammals with prolonged exposure to darkness can eventually learn to function with a freerunning rhythm. On the opposite end of that, those funny little blind cave animals can actually maintain their rhythm without any external cues. So why are humans so wimpy when it comes to getting a few extra ZZZs? The retinas in our eyes contain a type of specialized cell called a ganglion cell, which contain the photopigment melanopsin. 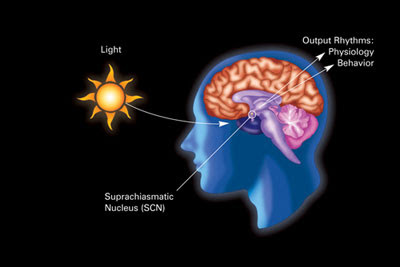 When we are exposed to sunlight, melanopsin signals follow a pathway leading to the suprachiasmatic nucleus (SCN). The SCN is a pair of cells located in the hypothalamus, a region in the brain responsible for regulating many important biological functions in our bodies. Go to bed earlier. Going to bed a little earlier (15 minutes) these next few nights will give you some additional time to adjust for the bigger change on the way. Take over-the-counter melatonin. Melatonin can be purchased at vitamin and health food stores, and can help realign your body's rhythm if you find yourself suffering from insomnia. Don't alter your schedule just because the sun decided to. When it's dark, it takes much more effort and determination to get those chores done or drag yourself to the gym. Figure out a plan in advance, and stick with it. Complain to your rental office about your neighborhood's poor lighting. Oh, wait, sorry—that last one was a note to myself. Photos courtesy U.S. Recall News, Wikipedia, and HBC Protocols. This post was contributed by Jordan Gaines of Gaines, on Brains. Follow on Twitter @GainesOnBrains.